Throughout its long existence, this 14th-century stalwart has been a secure anti-pirate bastion for precious fleeces, a jail for prisoners of war, an early aviation workshop, a home for relics of the Titanic disaster, and is now a fabulous pub and microbrewery. 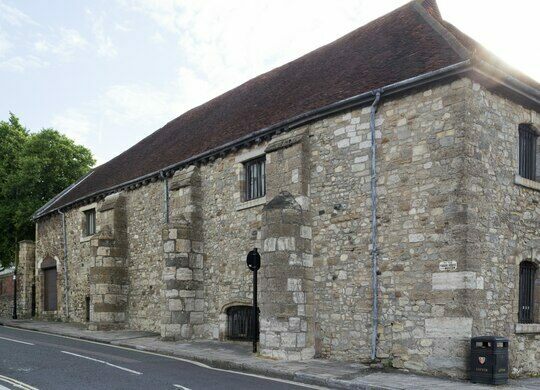 The Wool House is one of Southampton’s oldest buildings and was probably built following a devastating French pirate raid in 1338. For much of the medieval period, the port city was a major exporter of valuable wools and yarn to mainland Europe. The stone structure was erected as a defensive dockyard store for these cherished fleecy exports, probably as part of the late 14th-century fortification improvements that also resulted in the impressive Southampton Walls. During the Napoleonic wars, which once again pitted British forces against their French neighbors, the substantial fortress-like walls of the medieval storehouse kept foes in, rather than out, having been used to hold captive French prisoners of war. The identities of some of these captives are still in evidence, the former inmates having carved their names into the ancient beams supporting the heavy tiled roof. In 1910, a local boat maker who used the building as his workshop constructed a flying machine in the Wool House just seven years after the Wright Brothers’ first flight at Kitty Hawk, North Carolina. Inspired by the American aviation pioneers, marine engineer Edwin Moon became the first person to fly from the site that would later become Southampton Airport. In the 1960s, the venerable structure became the home of Southampton’s Maritime Museum, which celebrated the nautical history of the ancient port city. The ill-fated RMS Titanic, which set sail on her doomed maiden voyage from a dock 800 yards from the Wool House, was crewed mostly by locals. Some 500 Southampton families lost a relative in the disaster. Before the construction of a new museum in 2012 to mark the 100th anniversary of the sinking, the Wool House housed a touching display of memorabilia and artifacts salvaged from or relating to the Titanic and its local crew. After a period of being vacant, a pub landlord acquired the empty edifice and converted it into the new home for a successful microbrewery, pub, and restaurant, thereby keeping the doors of one of the area’s most significant historic buildings open to the public, while complementing the city’s lively nightlife scene. The Wool House is located close to the Isle of Wight Ferry Terminal. It is currently home to the Dancing Man Brewery, restaurant, and bar, open Wednesday through Sunday. The longest stone bridge in England has an impressive history that dates back over 700 years.